It's well known that steaming food is an efficient and healthy way to cook - meat and fish hold onto their succulence and flavour, no oils or fat are required and nutrients don't get drained away. 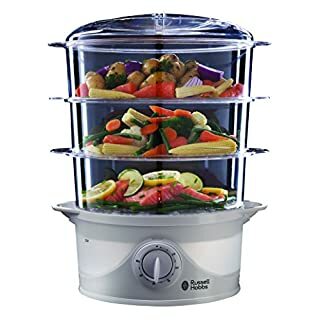 All your family favourites can be created, from salmon steaks and crisp vegetables to perfectly fluffy rice, while placing different types of food in each layer means all the elements of a meal can be cooked together without juggling pans on your hob.Making it easier than ever to create succulently healthy, steamed food, Russell Hobbs' 3-Tier Steamer has been created with a turbo steam ring that creates steam in just 40 seconds so it's ready to cook in next to no time, has a 60-minute dial timer to allow you to schedule cooking at a time that suits, and a thermal safety cut-out switch just in case you forget to top up the reservoir.Includes: 3 steamer baskets with integral egg holders (food capacity 9 litres) and a 1 litre rice bowl. Baskets, lid, rice bowl, reservoir lid/drip tray and steam tube are dishwasher safe.Model number 21140-1About Russell HobbsAt the heart of British homes for more than 60 years, Russell Hobbs have a long history of innovation - they invented the very first automatic kettle in 1955 - so it's no surprise that they're the number one brand for small electricals in the UK.Reservoir 1.3 litre capacity. 23.5 x 41 x 31.5cm H. 1.79kg. Flex 100cm. 800W. Reservoir 1.3 litre capacity. 23.5 x 41 x 31.5cm H. 1.79kg. Flex 100cm. 800W. 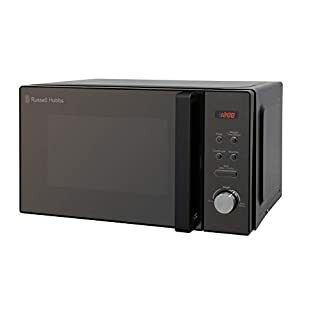 The Russell Hobbs Inspire 4 Slot Toaster will certainly inspire breakfast time with its black textured body and stainless steel accents. Adding a further touch of style to this toaster is the blue LED illumination. 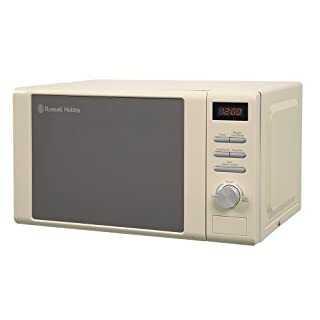 A variable browning dial ensures your toast will be browned to your exact requirements, whilst the frozen, reheat and cancel settings add to the toaster's versatility. 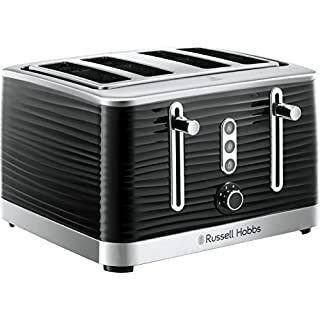 The high lift feature ensures toast can easily be removed without burning your fingers and removable trays catch any crumbs during the toasting process. Matching kettle also available. 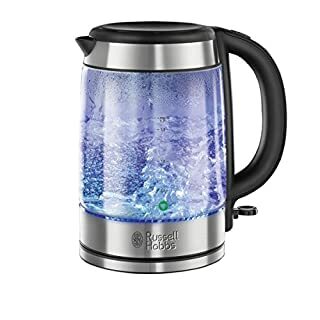 The Russell Hobbs Inspire Kettle will certainly inspire you every time it is used. 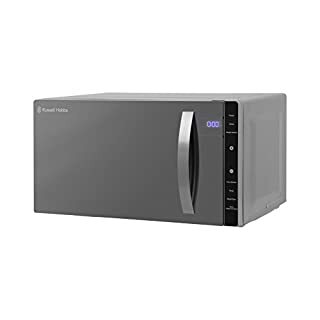 Its black textured body with accents of stainless steel will add style to any kitchen while the water gauge and power toggle are illuminated with ultra-cool blue lighting. A perfect pour spout ensures drip-free performance. 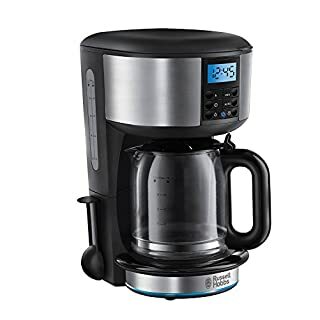 The powerful 2400w heating element can boil 1 cup of water (235ml) in as little 45 seconds, saving you time and energy. 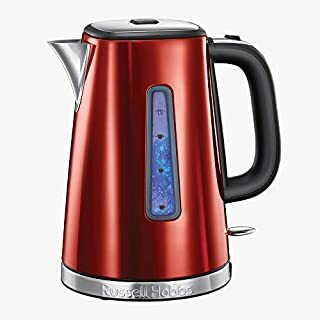 This 1.7 litre large capacity kettle sits on a 360Â° power base making it suitable for left or right handed use. The base also incorporates cord storage for a tidy worktop. Other features of this kettle include: Removable and washable limescale filter and boil dry protection. Matching 2 and 4 slot toasters are also available. The Desire Mini Chopper has a contemporary design and comes in a stylish matt black finish with red accents. Perfect for smaller items such as garlic, baby food and pasta sauces, this item really is a helping hand in the kitchen! The product is simple to assemble and disassemble so that it can easily and quickly be cleaned after use. 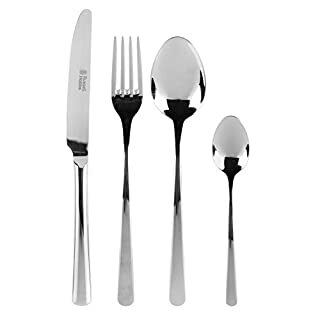 The compact design makes it easy to store away and it will take up very little space in your kitchen. The Desire Mini Chopper has a durable glass chopping bowl and comes with a universal blade which is suitable for all food types, a spatula, and a lid for storing food in the fridge after chopping. The easy one-touch operation button is so simple to use and the 380W of power means that food is chopped and blended effortlessly. :Tapping into the trend for the classic but striking combination of black and red and aimed at passionate cooks, Desire is underpinned by a solid build quality and uncompromised functionality, yet in a classic colour combination that lends itself perfectly to contemporary designs :Designed in house by our highly skilled design engineers, Desire is a food preparation range of contemporary appliances in a stylish matt black finish complemented by accents of vibrant red :The trend towards home dining has created more consumers that are passionate about and enjoy cooking. Desire range reflects this passion that consumers feel and offers appliances that make this easier and more enjoyable. 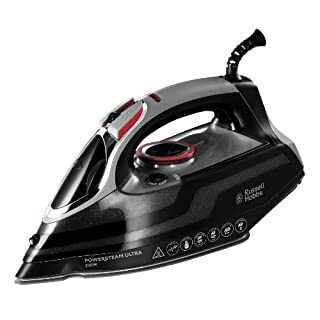 The Russell Hobbs 20630 Power Steam Ultra Iron is a welcome addition to anyone who finds ironing a chore. Detailing a Ceramic Soleplate with button grooves means the 20630 delivers a great result with little effort. 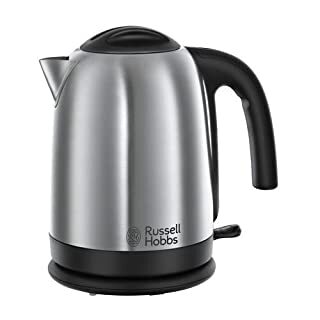 With features such as triple action cleaning, improved glide and a 15% faster heat up time the Russell Hobbs 20630 is both practical and efficient. 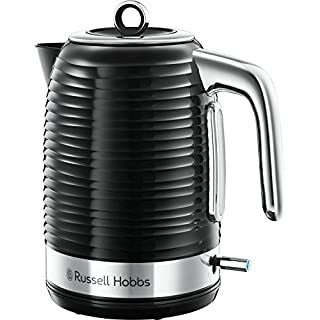 The Russell Hobbs Mode Electric Jug Kettle in Black easily adds elegance to your kitchen. The water gauge and easy pouring lip illuminate with blue light every time you boil the kettle, while the 1.7 litre capacity is perfect for making everyone in the family a cuppa or filling pots quickly when you are cooking. The side gauge and illuminated water window makes it easy to see how much you need for a round of drinks, ensuring you do not waste money on boiling too much water.The push button lid makes it easy to open while filling up under the tap, and a 3000 Watt Power concealed water element ensures easy maintenance as well as rapid boiling ability. The 360 degree base with integrated cord storage ensures your kitchen counter tops stay clutter free and that both left and right handed users are accomodated for. Tapping in to the trend for the classic but striking combination of black and red and aimed at passionate cooks, the Desire is underpinned by a solid build quality and uncompromised functionality, yet in a classic colour combination that lends itself perfectly to contemporary designs. : Designed in house by our highly skilled design engineers, Desire is a food preparation range of contemporary appliances in a stylish matt black finish complemented by accents of vibrant red. :The trend towards home dining has created more consumers that are passionate about and enjoy cooking. Desire range reflects this passion that consumers feel and offers appliances that make this easier and more enjoyable. :The Desire 3-in-1 Hand Blender is an ideal, easy to use functional food preparation set. 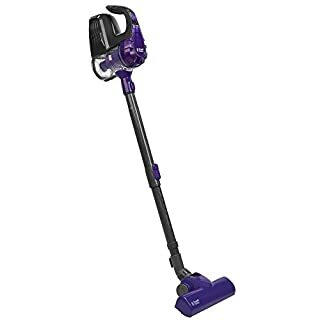 The durable, detachable stainless steel shaft has a stainless steel blade and comes with 2 speed settings and 400 watts of power. 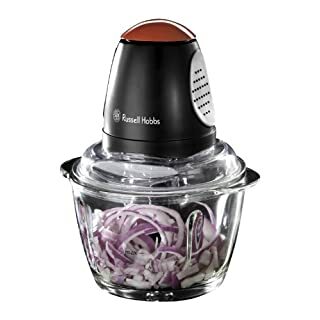 It comes with a 0.5 litre capacity chopping attachment which includes a strong stainless steel blade, an 0.5 litre capacity beaker and an additional whisk attachment. 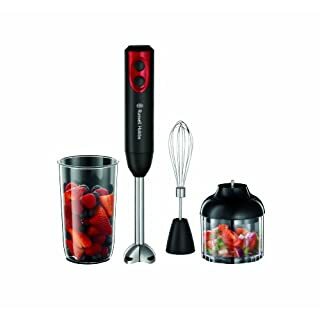 The Desire 3-in-1 Hand Blender comes in a stylish matt black finish with red accents. The Russell Hobbs Legacy Quiet Boil Kettle in cream is packed full of innovative features. 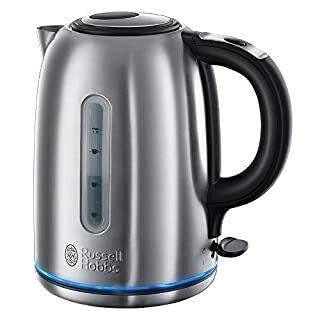 The pleasing design of this 1.7 litre stainless steel kettle acknowledges Russell Hobbs' heritage having created the first automatic electric kettle over 60 years ago. The downside to many modern rapid-boil kettles is the amount of noise they generate. 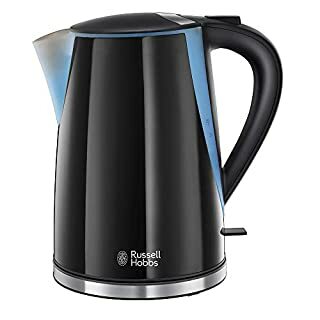 Not so with the Russell Hobbs Legacy Kettle. Using quiet boil technology makes the Legacy kettle up to 70% quieter than average kettles. The perfect pour spout maintains a streamlined flow from kettle to cup. An internal widget with 1, 2 and 3 cup markings lets you boil just the amount of water you require which can save up to 66% energy and allows you boil 1 cup of water in just 45 seconds. The 360Â° base allows left or right handed use and also incorporates cord storage. A concealed heating element and removable and washable filter help prevent limescale build-up. 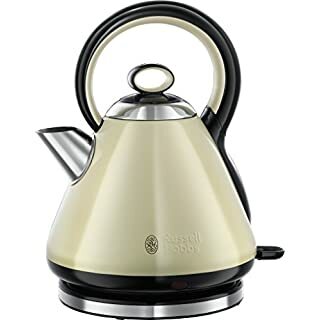 Other features of the Russell Hobbs Cream Legacy Quiet Boil Kettle include: Water level gauge; Auto switch-off and boil-dry protection. 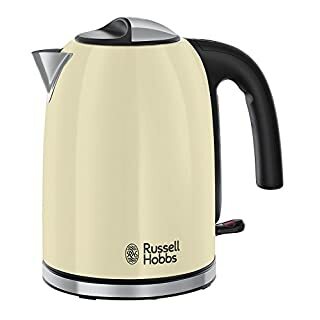 Supplied with a 2 year Russell Hobbs guarantee. Matching cream Russell Hobbs Legacy 4 Slice Toaster and Legacy Digital Filter Coffee Maker available separately.